A mainstream mid-sized SUV versus a premium compact sports utility vehicle… Well, who said cross-shopping is always about comparing direct rivals? 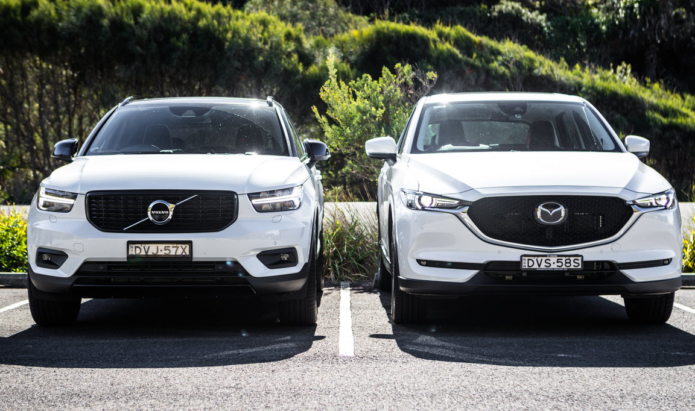 This comparison between the 2018 Mazda CX-5 Akera and new Volvo XC40 T5 R-Design stems from a CarAdvice reader’s request – yes, we listen to you! – and it throws up some tantalising questions we also wanted to answer. Can Volvo’s most affordable SUV continue the brand’s determined push to be considered a genuine premium carmaker? And is the CX-5 still good value in All You Can Eat (otherwise known as the Akera variant) specification? Pitching the XC40 against a high-spec mainstream model is as effective a way of finding out as comparing it with similarly priced peers (which, for the record, are the Audi Q3, BMW X1 and Jaguar E-Pace). Dealing with the price gap straight away, it’s an $8800 jump from the $46,190 CX-5 Akera to the $54,990 XC40 T5 R-Design. You can extend that by another $1150 as metallic paint is an option on the Volvo, but inclusive on the Mazda (with exception of Soul Red). That’s a significant five-figure advantage for the Mazda (helped by the Akera’s $800 cut for 2018), and the flagship CX-5 doesn’t disappoint for standard gear. Technology includes adaptive cruise control, LED (adaptive high beam) headlights and tail-lights, windscreen-projected head-up display, lane-keep assist and lane-departure warning, rear cross-traffic alert, blind-spot monitoring, traffic-sign recognition, keyless start, forward obstruction warning, driver-attention alert, and autonomous emergency braking (AEB). A 360-degree camera is new for 2018. The 7.0-inch MZD Connect touchscreen infotainment system is complemented by digital radio, navigation and a 10-speaker, 249W Bose audio. You need a $2500 Tech Pack to equip the XC40 with radar cruise control, 360-degree camera, plus a semi-auto parking system not available on the CX-5. The adaptive cruise also incorporates partial self-steering, essentially for freeway driving up to 130km/h. Another $2500 Lifestyle Pack is needed to match the Mazda’s heated front seats and sunroof, though the Volvo’s is a proper panoramic set-up. The full-length sunroof as well as Harman Kardon audio are each available for a relatively reasonable (in luxury-brand terms) $1200. The Volvo isn’t without its own equipment advantages, either. Even in Momentum trim, the XC40 brings a 9.0-inch portrait-format touchscreen, a 12.3-inch digital instrument cluster, wireless smartphone charging, smartphone integration, tyre pressure monitoring, hill descent control, voice command, and a cabin-air-filtering system. R-Design then brings one-ups such as 20-inch wheels, paddleshift levers, interior ambient lighting, while it counters the Mazda’s black leather upholstery with seats combining velvety, suede-style Nubuck and perforated Nappa leather. It’s worth highlighting servicing costs here, because the Volvo’s are remarkably high. Whereas the Mazda’s capped-price program quotes $1596 for five years at 10,000km/12-month intervals, Volvo dealerships will ask $4030 over the same period through SmartCare (though up to 75,000km). Make that $6345 for SmartCare Plus if you want wear-prone items such as wiper blades and brake pads/discs changed during that time, and software updated. It’s not just a mainstream-versus-premium anomaly, either. BMW’s five-year (80,000km) Service Inclusive package for the X1, for example, costs from $1395. The front portion of the XC40’s cabin feels more compact than the CX-5’s, with the top of the windscreen closer to your head without being intrusive. Your eyes will be more naturally drawn to the Scando-cool interior, with its stylish vertical air vents, prominent central touchscreen, grid-graphic trim inserts, and carpet and door-pocket lining that is manufactured predominantly from recycled plastic bottles (and even available in bright ‘Lava’ orange, emphasising the model’s younger demographic). If the interior isn’t as luxuriously presented as Volvo’s bigger SUVs, as would be expected, the XC40 brings tangible material and switchgear quality to the compact SUV segment. So, while you’ll find more hard surfaces than in either the XC60 or XC90, soft and smooth plastics are in sufficient supply. The sculptural front seats aren’t just for show, either. Electrically adjustable like the CX-5’s, they provide some extra support compared with the Mazda’s. Their lean design helps create some extra space behind – where tall passengers won’t feel short-changed on either knee or foot room – while the curved headrests also create a sense of extra space. Head room, tightened by the optional panoramic sunroof, isn’t quite as generous as it is in the CX-5, though complaints from six-footers are unlikely. That large sunroof is helpful for introducing some welcome light into the otherwise dark XC40 cabin, which isn’t helped by the high rear window line that also limits vision for smaller passengers. Mazda has continually improved the CX-5’s interior since the original debuted in 2012, and this is no better showcased than in the Akera. The black stitched-leather seating looks classy, soft-touch plastics – including on the centre console sides – are prominent, while a smattering of gloss-black surrounds and fake-wood inserts continue the positive visual impression. One-touch window operation all round is also a nice touch. Buttons and dials just don’t operate with the same level of feel as the Volvo’s, reflecting an overall view of an interior that distinguishes itself in the mainstream segment without reaching the richer detailing of the XC40. And while the CX-5 is 12.5cm longer, there’s only 2mm between the respective wheelbases (note the Volvo’s super-short overhangs) – and not surprisingly there’s virtually no difference in rear leg room. For longer trips, adults may just prefer the CX-5’s higher-set bench that better limits the space between seat and thigh. Both models provide rear air ventilation (another Mazda improvement over the original). The XC40’s attention to storage solutions brings more than just one surprise-and-delight feature. In addition to the inductive charging tray that’s perfect for accommodating your smartphone, there’s a drawer under the driver’s seat, a coin holder on the passenger side, a retractable bag hook in the glovebox, a big lidded, rectangular console compartment, and a removeable waste bin. Volvo also relocated audio speakers from the doors to behind the dashboard so it could create lengthy door pockets that can hold items such as laptops, bottles or small umbrellas. Rear door pockets are designed specifically for small bottles rather than anything else, though there are netted pockets, octagonal cupholders in the centre armrest, and useful storage trays each side of the rear bench. The CX-5 doesn’t spoil owners as much when it comes to storing odds and sods, yet the Mazda can’t be accused of neglecting storage, either. Its door bins are wider than the Volvo’s, there’s a compartment for your mobile ahead of the gear lever, two cupholders, and a good-size console bin includes a handy tray along with a 12-volt socket and USB (2) and AUX ports. Also common are seatback pockets and an armrest with two cupholders. Mazda’s armrest is a touch cleverer, though, as it incorporates a lidded, felt-lined tray with USB ports and a slot for a smartphone. Vehicle packaging has never been the CX-5’s strongest point, though, and like rear cabin space, its boot space doesn’t seem to take full advantage of the SUV’s 4.55m size. While improved slightly over the original model, 442L is a capacity eclipsed by a number of smaller SUVs. That includes the XC40, even if the Volvo’s 459L isn’t a benchmark itself (the smaller Skoda Karoq, for example, provides between 479L and 588L). Fold the seats down and the CX-5 edges ahead for maximum volume: 1342L v 1336L. The Mazda also comes with standard release levers for lowering the 40-20-40 configuration, whereas electric release buttons are optional on the XC40. The Volvo’s 60-40 seatbacks fold completely flat, and its 60 section incorporates a ski port with a neat felt flap on the cabin side. The Mazda’s middle section is effectively its ski port, though it exposes the boot to the rear cabin. Mazda’s boot comes with a cargo blind, 12-volt socket, flip-out tie-downs and little side compartments accessed by pulling a strap. There’s also a 12-volt socket in the Volvo’s boot, while it features integrated side hooks (for shopping bags) and a long elastic holding strap. An innovative touch is the cargo floor that can be folded upwards (see below) to divide the boot into separate compartments – with the divider including three shopping bag hooks. Or just fold it back to access the shallow compartment section, which is a natural storage place for the luggage net. Both models provide temporary spare wheels only and auto-operation tailgates, with the Volvo R-Design adding a hands-free open/close function. A 9.0-inch vertical touchscreen has been the focal point of new Volvo interiors since the 2015 XC90, and it’s standard even in the company’s most affordable SUV. Flanked by two vertical, ovoid vents, it’s a classy-looking display – minimalist, with just a handful of physical buttons (including a Home button) below it. It requires plenty of interaction, however, before you could start to call it intuitive, as the majority of functions are contained within the multi-layered menu system. So even simple operations such as switching off the stop-start system or altering cabin temperature require more than one touch (or swipe) of the screen. The display is responsive, though, and an alternative is to use the standard voice-command system, activated by pressing a button on the steering wheel and one of the more effective systems that doesn’t involve repeating yourself several times. CarAdvice testers weren’t impressed with the rear-view camera. Aside from the optional 360-degree camera not being the default view when selecting reverse (touchscreen needed again), the fish-eye lens doesn’t provide an optimum view behind. The CX-5’s rear-camera set-up is much clearer and sharper – especially the Akera’s new surround-view system. Testers also found they spent less time looking at the CX-5’s touchscreen thanks to the simple rotary dial/joystick and surrounding shortcut buttons. The menu system, though, looks simplistic in comparison, the screen seems on the small side (especially for a flagship model), and it’s odd the touchscreen can’t be used on the move. The respective audio systems both sound superb, though the Akera’s 249W, 10-speaker Bose system is standard, whereas the XC40 R-Design’s 13-speaker Harman Kardon unit is part of an option pack. Diesel power is a $3000 option on both of these all-wheel-drive vehicles, though we would be most tempted to tick that box for the CX-5. Mazda’s 2.2-litre turbo diesel was the pick of the mid-sized SUV’s engines even before it was upgraded for 2018 with more refinement, power and torque. It now has the same power (140kW) as the 2.5-litre four-cylinder petrol we’re testing here, while it offers nearly 200Nm extra – 450Nm v 252Nm. The 2.5-litre’s maximum torque isn’t produced until 4000rpm, either, and the lack of assertive pulling power is noticeable. Yet it’s still a good engine, and one helped by an even better six-speed auto. The transmission is quick to detect when a lower gear would help progress and it’s as smooth as it is decisive. So performance is adequate in everyday driving, and particularly enjoyable if you’re in the mood to use higher revs on the open road – flicking the console switch to Sport for increased response. Volvo’s D4 turbo diesel is a fine motor, though the T5’s 2.0-litre four-cylinder turbo costs less and offers more vitality. With 185kW (at 5500rpm) and 350Nm from 1800rpm all the way to 4800rpm, the XC40 has the far stronger and livelier petrol engine out of this duo. The R-Design brings paddle levers, too, to better engage with the zesty yet refined performance available when the turbo engine is on the boil (some low-rev lag is highlighted in more spirited driving) and Dynamic mode is selected. The eight-speed auto could just be quicker on downshifts in quicker driving, though for most people, for most of the time, it changes gears neatly and precisely. The XC40 is heavy for a compact SUV – at 1710kg it’s 33 kilos heavier than the bigger CX-5 – yet its quoted 0–100km/h time of 6.4 seconds puts its standing-start acceleration on a par with a Golf GTI (albeit aided by extra traction). Mazda doesn’t provide a figure for the CX-5, though there’s no doubt it felt slower and its fuel usage advantage isn’t a decisive factor here: 7.4 litres per 100km against the T5’s 7.7L/100km. The Volvo prefers to slurp more expensive premium unleaded, though. The CX-5’s figure is reduced fractionally for 2018 with the addition of cylinder deactivation, which essentially turns the engine into a two-cylinder on a light throttle. The XC40 is the first Volvo to sit on the Swedish brand’s new compact modular architecture that will underpin a host of small vehicles including a next-generation V40 hatchback. It still shares driving characteristics with the XC60 and XC90, including cornering behaviour that is enjoyably benign through its predictable grip, accurately linear steering and body roll that is noticeable but not upsetting to the Volvo’s balance. Smaller dimensions make the XC40 feel nimbler than its larger siblings. The big, 20-inch wheels mean it also inevitably rolls along with a high degree of firmness that can often override the suspension’s inherent suppleness. We’re keen to try an XC40 Momentum that rides on 18-inch wheels, as the suspicion is that these would trade some style for an extra layer of comfort. The XC40 isn’t available with optional air suspension like the bigger Volvo SUVs. Mazda’s CX-5 Akera isn’t a paragon of smoothness either, as its 19-inch wheels bring a sharpness to the low-speed ride over prominent surface aberrations. The ride feels softer, though, and offers extra compliance on country roads. And not at the expense of dynamics, because the CX-5 remains one of the most satisfying SUVs to steer. Point the Mazda into a bend and it tips in with sharp eagerness, while the CX-5 feels more light-footed than the XC40 in quicker directional changes. Its brakes, while not providing the immediate bite of the Volvo’s stoppers, provide better brake feel when modulating pedal pressure. Mazda has been attempting to cure chronic tyre noise issues related to its models, and there wasn’t a discernible difference in wheel-arch rumbling between the SUVs on coarse-chip country bitumen. The Volvo’s rubber, in fact, was the noisier around town, if not intrusively so. Two differently sized and differently positioned SUVs. One compact, one mid-sized. One luxury, one mainstream. The onus is always on a luxury-labelled vehicle to justify its higher cost. The Volvo XC40 T5 R-Design achieves this to a certain extent with its superior drivetrain (slightly frustrating gear lever operation aside) and an interior offering tangibly higher quality, a more sophisticated presentation, and more cleverly conceived practicality and packaging. Its autonomous emergency braking system is also more advanced than the Mazda’s in what it can detect, as is its adaptive cruise control. The Volvo, however, costs more than $15,000 over the CX-5 Akera if you add options to match the Mazda’s spec – a gap that blows out to about $17,500 once you factor in the Swedish brand’s high servicing costs over five years. We’d be tempted to take a T5 Momentum loaded with a few key options, which wouldn’t look quite as stylish as the T5 R-Design, but would save thousands. It may also have tilted the balance of this comparison in the Volvo’s favour. As it is, the CX-5 Akera combines its value advantage with the generally smoother ride and slightly more engaging dynamics to edge a tight fight between mainstream and luxury.